Purchase this Ebook Now at Amazon, Bookbaby, iBooks, Barnes and Noble and other online book stores soon. Dogma is something you believe intellectually or on faith; Wisdom is something you know through Direct Experience! We are on an evolutionary path that includes the Wisdom Teachings but goes beyond them. This is the nature of evolution. As our consciousness evolves, we can take the best of the Wisdom Teachings and combine it with what we are learning in this incarnation through Psychology, Physics, life experience and through our Direct Experience. New technologies and ways of working energetically are continuously developing. This is the way that the evolution of our consciousness occurs_ the Old teachings and the New merge into something greater_ creating new form and building the foundation for a New Age! 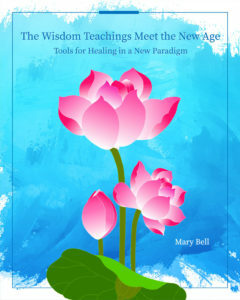 Join Mary as she explores the difference between spiritual wisdom that originates from Metaphysics and what originates from the Spirit level of reality_the Non-Dual_ a level of consciousness that is beyond the soul and beyond the subtle levels of reality. As she compares New Age philosophy with tenants of Gnostic Christianity, the question arises “What is evil, where does it come from, and how can we transform it? 2. Where does Evil Come From? That’s because what was being called “spiritual” was unknown to many people or being touted by people who were not well grounded and may have appeared to be charlatans. I took the position that the term and the concept of the New Age was really sacred and not eccentric when it was used by people who were well grounded and experienced in what they were doing. Was the work really “new” or actually “old” work being brought back and revitalized? I think both were true; there was old work being brought back but some of it was new! And it still is. New ways of working energetically continue to be developed as we evolve our consciousness. I don’t hear that term ”new age” too much anymore but we are in a New Age_a new paradigm of reality here on the earth plane. when we connect with it, we can remember who we are, and begin to live from that place. This is our task right now on the earth plane_ to connect to this level of consciousness, integrate it and become conscious co-creators with the Divine! In so doing, we will raise the vibration of the earth plane. People “on the path” of spiritual growth typically study spirituality from the “metaphysical” perspective first, which has its own way of seeing and describing reality. …Metaphysical teachings, which describe levels of reality that are beyond the physical plane of reality that we ordinarily see, have been explored and described, channeled and written about by authors and teachers often ahead of their time. Much of it developed a century ago with Alice Bailey and others who were trans-channels. They wrote about their experiences and taught their work. At that level we learn about Spirit Guides, Ascended Masters, Angels and other “ spiritual beings”. Then there is another progression and you move into the realm that is “beyond Metaphysics”. You begin to experience and understand reality from yet another perspective_the Spirit level_ and from there your perception of reality and understanding of the way things work changes again. Once you reach this level of consciousness, you don’t replace the consciousness of the soul and ego levels, you “plug them in higher” and become aware that you exist at all three levels at once _ ego, soul and Spirit! It is not a philosophy or something you can just read about or study intellectually; it is something you need to experience to understand. Teachers of this level of consciousness help you to experience it directly so that you can “know” it for yourself. Once you have experienced it, then you can describe it. You are embarking upon an entirely new level of understanding. You cannot integrate it into what you already know until you have experienced it. Then, slowly you can see how it all fits together. …They may study anatomy and may learn techniques that they can duplicate. Many times they learn to work from the masculine principle deciding intellectually which techniques to use and then doing them. But there is another way to work; it is from the feminine principle where healing is done from the place of surrender. When we surrender our egos, we allow higher states of consciousness to guide us and to work through us and to lead the healing. Then we describe what is happening as it unfolds. Traditionally, healers learn to work first with the physical body through massage, chiropractic, body psychology and other physical modalities, and then with the auric field_the seven layers of reality where blocks to the physical body originate. But sometimes this type of work is limited, because the origin of some blocks are really on higher planes of reality_planes that we must be able to reach energetically in order to heal them. Sometimes the root of the issue resides at the DNA or cellular levels well beyond the subtle levels. And sometimes the healing needs to occur at the ego level within the selves that make up the personality. This level can disrupt all the other energy levels and may need to be addressed first. It is only recently that I have realized that the way in which I have been guided to work and to teach is based on many of the concepts used by Gnostic Christianity_ Direct Experience, the process of Surrender, the Divine Feminine and its place within Christ Consciousness. I am not formally a Gnostic Christian but then maybe I have been one before and am a covert one now? I have read about the Gnostics off and on over the years, but as I read of them now, I resonate with their philosophy in a meaningful way. The manner in which I have been guided to work and many of the things I have channeled are confirmed by many of the Gnostic writings_ direct experiences that many others have had rather than religious dogma. I have always known at some level that what religions taught was not quite accurate; at least it was not enough for me. But to read that what Christ and Mary Magdalene really taught was the path to enlightenment_ that is something I can get behind! The path of Direct Experience is the way I have been guided my entire life, especially on my spiritual path. Making a connection with my Self and speaking and writing from that place has been my way. There were many forms of Gnosticism, Pagan, Hindu, and Buddhist which predated Christianity, and then others that occurred simultaneously and were a part of the original Jesus movement. What they shared in common was the philosophy that salvation or enlightenment could only result from direct and personal experience_thus gnosis. The word gnosis means knowledge in Greek and to a gnostic can only be obtained from within oneself and one’s own mystical experience. It is a place that sees reality from the perspective of Pure Awareness_ the Spirit Level of Creation_ the level of consciousness that exists beyond your individuated soul. It sees all but it judges nothing and it functions from the place of Unconditional Love.This is the level, the Shift in Consciousness the earth plane is evolving to now, that not only can we achieve in this space in time but that we must achieve in order to become conscious co-creators within the world and within the Spirit Level of creation. The energy is here to support us in this transition; It’s a gift but one you can accept or not accept because you have free will. What each one of us decides now will influence not only our own futures, but the future direction of the planet and the evolution of consciousness in the world.